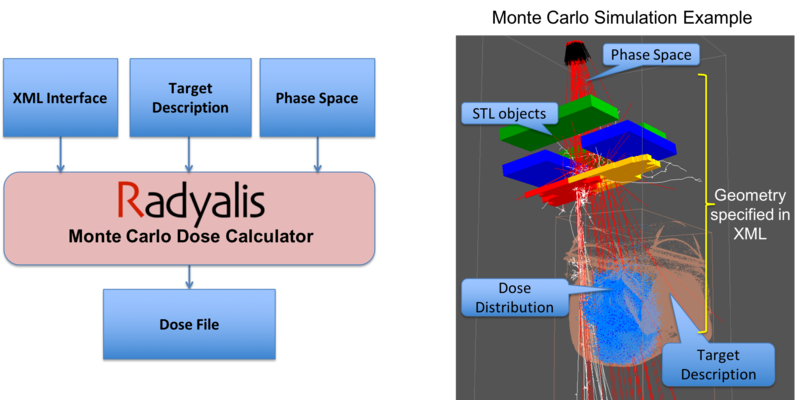 Radyalis takes Monte Carlo analysis for radiation therapy applications to new levels of accuracy, performance, and capability. The Company’s Software is optimized for medical physics applications and is differentiated from its competitors through proprietary intellectual property including advanced convergence techniques, statistical noise control, dosage uncertainty bounds, and fully automated commissioning for photon and proton radiation therapy. The Radyalis Monte Carlo Dose Engine can used as a stand-alone program or as a server (local or cloud), or be integrated within an end-application. It is driven via an XML interface and DICOM format files. Within the XML description, the patient volume, the beam geometry and magnetic field, the phase space (particle distribution), and control parameters are all simply defined. The Target Description defines the region where a dose distribution is to be collected and can be at the same voxel resolution as the CT image to ensure maximal accuracy in the predicted dose. All relevant NIST materials, biologicals, metals, and plastics are supported. The Radyalis implementation is comprehensive and covers beam head, magnetic fields and patient transport. Radyalis models are grounded in first principals transport physics and precisely consider inhomogeneity, primary and secondary effects, and material composition. Radyalis provides statistical metrics at the dose-volume histogram (“DVH”) level to indicate the degree of dose uncertainty. The Software can also be utilized for analyzing dosage changes due to computed tomography (“CT”) imaging tolerances, patient positioning, and patient motion for robust-planning applications.